Sometimes I am guilty of judging books by their covers. Or, if not by their covers, then by their titles. It's lucky that I have friends who know this and will push me to read novels I might otherwise pass by. 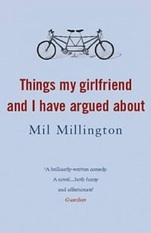 Mil Millington's novel Things My Girlfriend and I Have Argued About is just one example – but it is, perhaps, the best. I don't think I've ever laughed so hard when reading a book (and I am someone who truly laughs out loud), and I might have missed all that hilarity if I'd just passed by the purple book with the lengthy title. Pel Dalton works in the tech department of a university library – or, rather, Learning Commons. He's not terrible at his job, but he isn't stellar, either. After his boss, TSR, stops coming in to work one day, Pel is promoted, even though he isn't all that qualified or sure what the new job entails. What he discovers is that the Learning Commons, despite being a library, is anything but quiet. Pel lives with his girlfriend Ursula – who is German – and their two kids. Ursula is the kind of character who you imagine judging your reading posture. She is eminently practical and able to compartmentalize, two qualities which Pel does not embody. In some ways, Pel seems like yet another child for her to take care of, but in others, Millington portrays their relationship as a mutual one: they may come at situations from different angles, but their ability to meet in the middle to sort something out is what makes their partnership work. The nice thing about Millington's comedy is that it doesn't fall into clichés about the bumbling boyfriend/dad and his commanding and capable girlfriend. Pel is perhaps less obviously capable, but his character is fully formed and his misadventures are entertaining because you genuinely like him. In many ways, reading about Pel trying to escape from meetings through bathroom windows is like hearing a story told by a good friend – you know that it's going to work out, but you can hardly believe what happened. Millington lets you laugh with Pel as much as you laugh at him. Things My Girlfriend and I Have Argued About is not a serious novel about a broken relationship, or a thinly-veiled how-to relationship guide. Neither is it a series of short stories (which the title almost hints at). Rather, it's a novel about a full-formed relationship. Pel ad Ursula argue about all sorts of piddly little things – defrosting the fridge, PTA meetings, how to deal with the builders working on their new house, etc. – but none of their arguments are make-or-break. Their relationship isn't perfect, but neither is it about to collapse: they love each other, they love their children, and they balance each other out. In a lot of ways, Pel and Ursula's relationship is refreshing in its ordinariness. Granted, Pel manages to get himself into some truly ridiculous situations, but Millington makes them all believable because he doesn't leave any holes behind in the plot line. Things My Girlfriend and I Have Argued About is a really satisfying read because it doesn't sacrifice sense for hilarity, or a well-crafted plot for bizarre scenarios. By the end, although you might not want to date Pel, he certainly becomes someone you'd like to hang out with, if for no other reason than the crazy stories he could tell. Oh Angela, I love your blog. Thanks for making my trips to the bookstore more purposeful.